Free Power Systems Education For Everyone & Forever ! 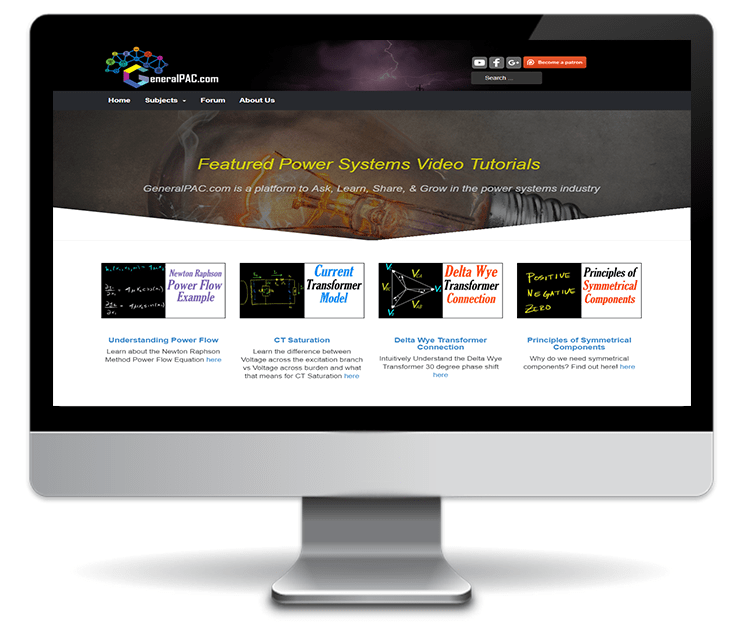 The GeneralPAC team promotes asking, learning, and sharing information and concepts about Power Systems through various platforms like youtube, forums, and webinars. Our international community are people who ensure that low-voltage, medium-voltage, and high-voltage power systems are safe, reliable, operable, maintained, protected, and well designed. We rely on our community, fans, and sponsors for financial support (through patreon.com/generalpac) so we can continue doing incredible work. In exchange, our partrons receive insightful content and special perks. Patrons have access to special perks like below. Perks for being a Patron! Patreon is a fantastic portal that allows our fans and community to make monthly financial contribution so we can continue creating high-quality power systems video tutorials.They take a small processing fee for managing the technology which allows us to focus on what we do best. We thank you for your patronage and rest assured about your subscription.